Mike got his start facilitating groups as a young leader in high school decades ago and found his passion at an early age. Mike is passionate about creating spaces where all voices are heard across differences. Whether it’s a retreat, a strategic planning process, a leadership development program, or an organizational change initiative you can be confident that Mike will both design and facilitate a process where all voices get heard and honored. As a seasoned professional who has hands on experience starting up and managing programs and organizations, Mike provides helpful guidance for organizations and businesses implementing organizational change initiatives. Mike brings a wide breadth of experience in board development, program management and transition management. 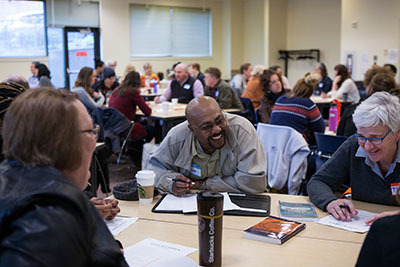 We recommend outside facilitation when it is critical to have the input of all staff during difficult conversations, long term strategic planning initiatives, and/or in the process of gathering community input. If you need help in running more effective meetings, we can provide meeting facilitation training. Mike enjoys helping non-profit and human service groups with their long-term and short-term strategic plans. He works in collaboration with staff and volunteers to create a process where all have a voice in the planning process. Mike utilizes T.o.P. (Technology of Participation) Strategic Planning methods to ensure a participatory planning process for your short term and long term strategic planning. ToP Methods keep strategic planning fun and interactive while also ensuring that all voices are heard. Mike and his colleagues with F.A.C.E. Consulting Collaborative can providing assessment, leadership coaching, and consultation with your diversity, equity, and inclusion initiatives. The F.A.C.E. team has experience working with schools, non-profits, public agencies, and businesses of all sizes. Mike has extensive experience in leadership curriculum development for both youth and adults. He enjoys assisting non-profit and human service programs in developing their educational curriculum for ongoing leadership development of staff, students, volunteers, and community members. Whether it’s the development of a volunteer training program, a staff leadership development plan, a ‘train the trainer’ manual, or a youth leadership training program, Mike can collaborate with your staff to write, edit, or enhance curriculum for your program or organization. Mike’s experience in this arena includes the creation of a supplemental curriculum to help students explore the difference between philanthropy as charity and philanthropy as social justice for Penny Harvest and the re-writing of a semester-long youth leadership curriculum for high school students for Youth Leaders of Promise. Additionally, Mike has been involved in the training of AmeriCorps and VISTA Members for over a decade now, collaborating on writing, training, and facilitating of several different training programs for AmeriCorps & VISTA members including but not limited to the Northwest VISTA Leader Retreat, the ongoing development of the current VISTA Pre-Service Orientation Curriculum, Life After AmeriCorps/VISTA, and NCCC Summer of Service Orientation.